Human rights lawyer, Femi Falana, SAN, on Sunday said the defection of Governors Aminu Tambuwal, Samuel Ortom and Ahmed Abdullahi of Sokoto, Benue and Kwara States respectively from the APC to the PDP cannot be said to be illegal or unconstitutional. Falana, in a statement said while the defection of the lawmakers from the APC was unconstitutional as there was no disintegration in the party, that of the governors was constitutional as the Nigerian constitution was silence on the defection of governors. “The Constitution is silent on defection by the President and state governors from the political parties which sponsored their election. Hence, in Atiku Abubakar v Attorney General of the Federation (2007) 4 SC (Pt II) 62 the Supreme Court held that the defection of the appellant from PDP to the former Action Congress of Nigeria was not illegal and unconstitutional. “On the basis of that judicial authority the decision of governors to dump the political parties which sponsored their elections was not challenged. I have therefore canvassed the argument that the defection of Governors Tambuwal, Ortom and Ahmed of Sokoto, Benue and Kwara states respectively from the APC to the PDP cannot be said to be illegal or unconstitutional,” he said. 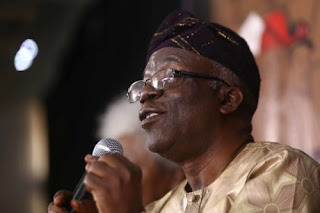 Falana explained that five governors had decamped from PDP to APC in 2014, saying that while relying on the decision of the Supreme Court in the case of Atiku Abubakar v Attorney-General of the Federation (supra), he expressed the view then that the defection of the governors could not be successfully challenged by the PDP. “In the same vein, I have opined that the defection or return of APC governors to PDP cannot be questioned by the APC. Since my view was limited to decamping governors in 2014, it is the height of intellectual dishonesty on the part of Dr. Doyin Okupe to accuse me of inconsistency. Whatever the agents of mischief may want to believe, I have been as constant as the northern star as far as the interpretation of the Constitution is concerned,” he added. On the Senate President, Falana said the planned removal of Dr. Bukola Saraki by the APC should be stopped as it could not stand, saying that the attention of APC legislators ought to be drawn to section 52 of the Constitution which provided that the President and Deputy Senate President could only be removed by the resolution supported by the votes of not less two thirds majority of the entirety of the members of the Senate. He said since the APC legislators could not muster the required two thirds majority of the votes of the entire member, the plan to impeach Saraki should be dropped forthwith. “Again, the scenario playing out in the Senate is without precedent in our political history. When the accord of the National Party of Nigeria and Nigeria Peoples Party collapsed in the second republic, the Speaker of the House of Representatives, Honourable Ume Ezeoke of the NPP, a minority party in the House was not forced to resign. The election of Honourable Aminu Tambuwa as Speaker was made possible by the alliance of PDP and ACN legislators. And when he decamped from the PDP to APC, Honourable Tambuwa was not asked to step down from the office of the Speaker. Therefore, the APC is stopped from demanding the resignation of Dr. Saraki as Senate President,” he said.